When you're reviewing your credit report once each year as all consumer should, you may notice that some of your financial accounts that don’t appear on your credit report. In some situations, you may see accounts on your credit report from one bureau but not on the other two. Or there may be accounts that don’t appear on any of your credit reports from the major credit bureaus. There are a few explanations for this, and it's all based on how credit reporting works. The account you're looking for may have dropped off your credit report either because the credit reporting time limit passed or the credit bureau’s internal reporting time limit for that type of account expired. Accounts closed in poor standing, i.e., you were delinquent when the account was closed, will fall off your credit report after seven years. That's based on the credit reporting time limit outlined by the Fair Credit Reporting Act. 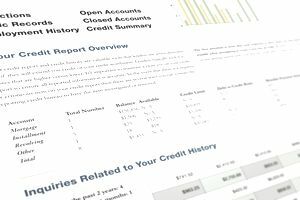 Other closed accounts will fall off your credit report after 10 years or so, depending on how long the credit bureau decides to report these types of accounts. There is now law that defines the amount of accounts closed in good standing must fall off your credit report. In the credit reporting world, businesses decide which (if not all) of the three credit bureaus they’re going to subscribe to. Your account will not appear on your credit report if the business doesn’t subscribe to a particular credit bureau. It explains why you may see an account on just one of your credit reports but not the other two. The account may not be a traditional credit account. Accounts like utilities, cable services, telephone, water, etc. fall into this category. Depending on the company and the state, some utilities may report to the credit bureaus, but they’re not required to do so. Unfortunately, delinquent accounts are reported even when regular, timely payments are not. So it’s important to pay on time even if you don’t see the account on your credit report. Many rent payments don’t appear on renters’ credit reports, especially if you’re renting from a smaller landlord. Accounts with larger property management companies are more likely to appear on either your Experian or TransUnion credit report. Historically, rent payments haven’t shown up on credit reports – except in cases of severe delinquency – so don’t be surprised if your rental history isn’t on your credit report. Credit scores are calculated based only on the information on your credit report at the time the credit score is generated. It does not consider what used to be on your credit report last year or even last week. If an account never appeared on your credit report, there should be no change to your credit score based on your payment behavior with that particular account. However, you may be missing out on a potential credit score boost from timely payments on an account. On the other hand, your credit score could rise or fall (relative to the last time you checked your score) if an account falls off your credit report, for example, because the credit reporting time limit has passed. It’s hard to predict which way your credit score will go because it depends on the account that falls off and all the other information on your credit report. Businesses aren’t required to report to the credit bureaus; it’s strictly voluntary. If an account isn’t showing on your credit report and you think it should be, contact the business to find out their credit reporting policies. There may have been a mistake with your account, and the business can update the credit bureaus with the correct information.